Ever wondered how you'd look like in a Santa Hat? How about wielding a powerful whip? Or perhaps wearing the fabled Third Age armour? Well, the time is here! With the Item Lending feature, you have the ability to give or lend items for a certain period of time. You will learn how to lend and borrow items in this guide. Lending an item is very easy. When a friend has "Accept Aid" turned on, simply trade with the person you wish to lend an item to. Along with the "Offer" options, there will be a "Lend" option. Simply choose how long you wish to lend the item for this person. This is a very simple interface. Simply click on someone, select trade, and then right click on your item in your inventory and select "Lend" down near the bottom. From there you can still select the "Until Logout" duration or you can right click and select edit to put in any number between 1-24 hours. Being lent an item involves simply clicking accept or decline when the offer comes up. This is a list of items in their categories that you can lend and receive. In addition, you may only lend or receive one item at a time. You can borrow one item and give one item, but you can't borrow two items or give two items at once. The only place where you can't take a borrowed item is in the Bounty Hunter Activity. There are also places where you can't make a borrow or lending transaction. Those places are in Barbarian Assault, Duel Arena, Tears of Guthix, and in the Chamber of Koschei the Deathless in Rellekka. After the transaction is completed according to the player's agreement, the item will be in a banker's possession either when the player who has the item dropped it, or the lending time has expired. 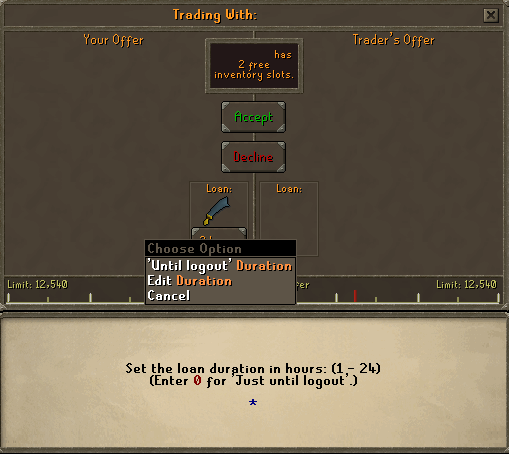 Simply talk to the banker with the option "I'd like to see my returned items box" and you will be directed to where you can get your item back. When you're borrowing a weapon or piece of Armor for combat, you must remember how long you have left with the item at all times. For example, you could be fighting a powerful monster and the item time would still run out and return to the person who lent it to you and you will be left for death. Remember, it is your responsibility to make sure how long you will have the borrowed item. When you borrow an item, there are certain things you can't do with it. This includes alching, selling to stores, placing it inside the drop party room chest, and trading. If you decide to drop it, the owner of the item will get it back. If someone borrowing your item dies with it, the item will be protected no matter what and they'll still have it. Think carefully before lending an item, there is no way to get your item back early. It's theirs for a max of 24 hours and a minimum of 1 hour. If you want to give an item back early, simply right-click on the item, select the "Use" option, and then click on the player you borrowed it from. The item will be instantly returned to him or her.